Hyperkin is a company known for its retro emulation consoles and affordable gaming accessories. It is not a company known for high quality mechanical keyboards, and the Super Nintendo-inspired Hyper Clack is not going to change that. The Hyper Clack mechanical keyboard is a retro-styled input device designed to appeal to the old school gamer, specifically fans of the North American Super Nintendo. 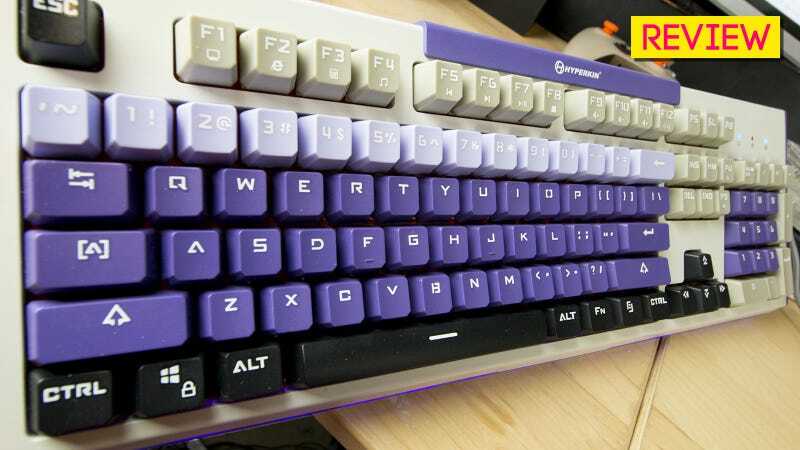 It features a pleasing combination of black, purple, lilac and gray key caps on an off-white plastic base with deep purple trim. LED lighting illuminates a translucent purple strip along the front edge of the unit. Style aside, the Hyper Clack is a pretty basic low-end mechanical keyboard. It’s got blue clicky Outemu switches, which seem to be the go-to for cheaper keyboards. The function keys double as media control keys. Users can switch between 6-key and N-key rollover, controlling how many keys register at once. Otherwise it’s all pretty standard. It’s So Super Nintendo-y: What the Hyper Clack mechanical keyboard has going for it is its distinctive look. When I wrote about the keyboard existing back in December of last year, I pondered why anyone would need a keyboard that looks sort of like a Super Nintendo. It’s a great color combination, one immediately recognizable by fans of the system (in North America at least). The Underside: I’m going to give the Hyper Clack points for a considerate underbelly. Not only does it feature hand cable routing for directing the USB to the left, right or center, it also features inner and outer flip out feet in the back, allowing for two different typing angles. I might be reaching a little. It Looks And Feels Cheap: Whether the result of retro design sensibility or keeping cost down, the Hyper Clack is several pieces of colored plastic joined together into one flimsy-feeling unit. The white top case of the keyboard is screwed into a purple plastic housing, with seams I can fit a fingernail inside. The plate the keyboard switches are mounted on is metal, but for some reason that metal has been painted red. I do not understand why a keyboard with such a specific color scheme would have a red plate. It makes no sense. The Typing: Light ABS plastic caps are only as good as the board they are placed on, and being paired with a flimsy plastic shell is not doing these caps any favors. There’s a great deal of key rattle, which doesn’t help. On a whim, I swapped out several of the caps with some extra thick, SA profile PBT caps I had, and even they felt pretty bad under these circumstances. The Key Caps: As pretty as they might look from a distance, up close the thin ABS key caps on the Hyper Clack lose a lot of their luster. We’ve got a horrid “gamer” font in play for one thing. Then the legends on the caps are screen-printed. If you look closely you can see the outline of the letters and symbols. Those aren’t going to last long. I won’t even point out the shape. ou can see the shape. A Very Minor Quibble: Purple keys. Lilac keys. Purple plastic accents. A glowing purple strip along the bottom of the board. Blue indicator lights. As I said, a minor quibble, but it’s driving me bonkers. On the plus side, the key caps are MX compatible and the bottom row of the keyboard is completely standard, so just about packaged set will fit perfectly. If you like the aesthetic of the Hyper Clack and don’t mind the cheap plastic and blue LEDs, you could easily replace the caps with higher quality versions in similar colors. I love these lil face caps so much. The folks at Hyperkin obviously have a deep-seated love of retro gaming, and I appreciate the attempt at creating a keyboard that captures the spirit of that love. The idea is very cool. It just didn’t come together well in the Hyper Clack.